A huge thanks to Guardian readers – and everyone else! 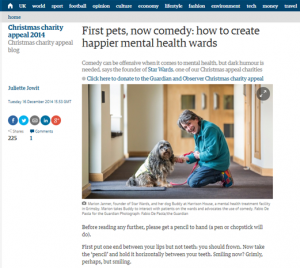 Star Wards was beyond thrilled to be chosen as one of the Guardian’s 2014 Christmas Appeal charities, along with eight fantastic mental health organisations. Guardian readers (and staff!) are renowned for their commitment to social justice and improving the experiences of people facing the hugest challenges. And the extent of the response to the Appeal was extraordinary, partly through a very lively blog and of course the powerful impact of so many wonderful stories from the Appeal charities. Thanks to the truly above and beyond, energetic and creative efforts of Guardian staff and the incredible generosity of Guardian readers, the appeal raised an epic £400,000! And Star Wards will, with unbounded gratitude, be receiving one ninth of this. This income will transform the support we are able to give to mental health wards, and we have seen over and over how staff and patients take our resources and create even more value from these by extending them through training programmes they introduce. And this vital cash was only part of why it’s been so brilliant being a Guardian Christmas Appeal charity. There were two fabulous articles about mental health wards and our involvement with them – a highly unusual opportunity to publicise all the superb work that goes on in the wards. Stu Heritage schlepped up to Grimsby to visit the magnificent Harrison House hospital, and wrote about it here. Then Juliette Jowit wrote about how comedy and humour are really important aspects of a positive experience of being an inpatient. 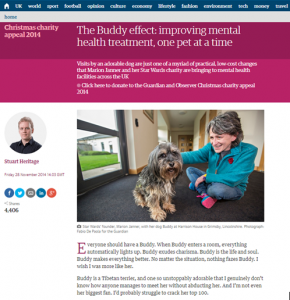 Because so much of the focus of the Guardian coverage, and readers’ responses, were about the massive benefits of having pets on wards, we are now energetically increasing our efforts to make this possible. The hashtag #animalmagic was suggested on Twitter, this being the title of the newspaper (rather than the online) article and a delightful description of the specialness of the relationship between animals and humans. 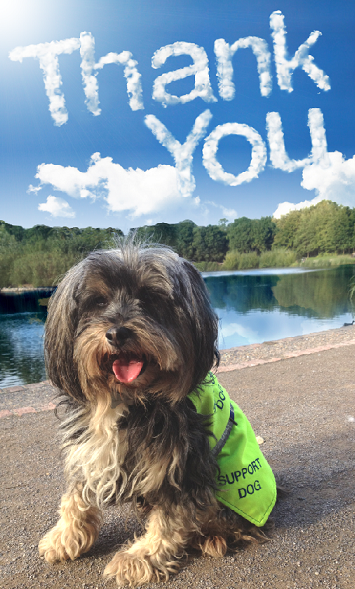 We will shortly be launching a new website called Animal Magic, with loads of resources and ideas to help increase the contact that patients can have with pets. We would like to thank (and we’d like to hug) all the Guardian readers who gave so generously to help mental health wards become even more therapeutic. We’ve already done lots of virtual and realtime hugging of Guardian journalists and would like to once again thank Stu Heritage, Patrick Butler, Emma Howard, Juliette Jowit and all the ‘behind the scenes’ Guardian staff who made the Appeal such a stonking success.